Hello loyal readers. 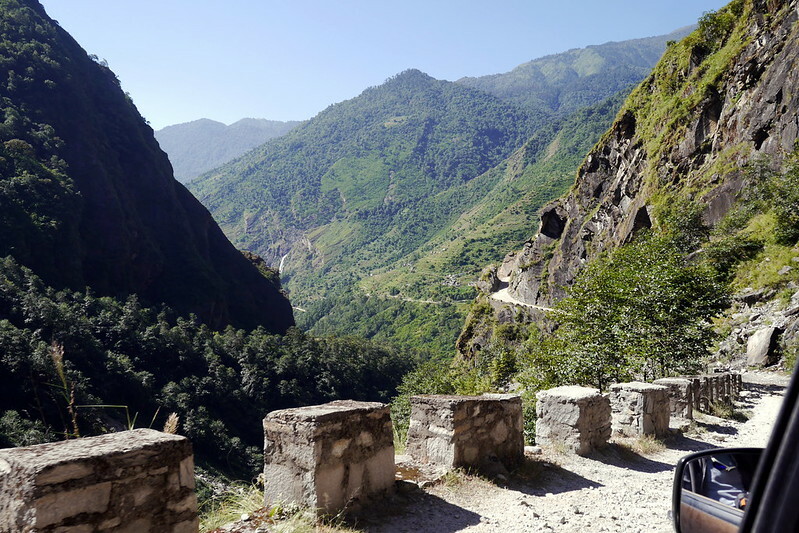 I’m here today with the final chapter in our Nepal adventures. Yes, I could split this one into several shorter posts, but given that nearly 5 months has already passed, and that summer is around the corner, I decided to just wrap it up with one final post (well, that and the postscript post of 24 hour in Abu Dhabi!). As you’ll see by the map below, this part of our trekking trip was about 6 total days of hiking on the southern part of the Annapurna circuit. As you can see, we started low, worked our way back up in elevation, to finally finish off at a road where we hitched a ride to Pokhara. Read on for tales from this part of our adventure. 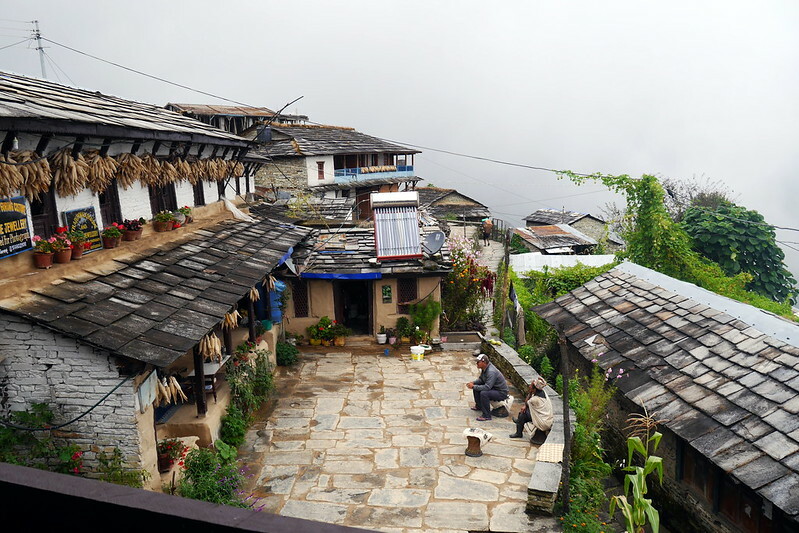 Tatopani can be translated to mean ‘hot water’, and this little village is well known for its hot springs. The day before we started trekking, we’d taken a 4×4 from Jomsom, our last stop, through small villages and the beautiful mountain valleys to end at this little town (you can click through on the album embedded below). As we made our way from the northern part of the circuit, the air became thicker, and temperatures warmer. When we finally arrived at Tatopani, we were shocked at just how hot and humid it was. In fact, it truly was a jungle-like atmosphere, complete with citrus trees and dense vegetation. We stripped down from long sleeves and pants to t-shirts and shorts, and were still hot. What a difference. We ended up with a half-day and evening to relax in Tatopani, since we weren’t leaving to start the next trekking till the following day. We took advantage of this time to just stroll around the area taking in the views, as well as eventually making our way to the namesake hot springs. Upon arrival it was just Deanna and I plus one other gentleman who had made the trip from far away to take advantage of the healing properties of the pools. However, as time crept by, large groups of school children ended up there after their school day, and things got crowded! We packed up and made our way back uphill to our guest house, opting to take advantage a local ‘happy hour’, which meant beer and popcorn for a low price. It was just the two of us and the business owner, so very restful indeed! The next morning, we got up, had our breakfast, and started our journey. We had about 14k to trek today, and would be gaining 1200m. It was already sweltering first thing in the morning, so no hope of avoiding working up a big sweat as we made our way uphill. We started out on the road, but soon crossed a river and were on the proper trails. Apparently there was a road that we could have followed uphill for a good chunk, but our guide opted for the more rustic (and steep) trails. In no time flat we all had sweat running down our brows and backs. This was STEEP terrain, and we stopped a couple times to rest. At one point, we popped back on the road, and paused in the hot sun to drink some water and eat apples. After a bit, another large group caught up to us there, surprised to see us. They’d left probably 40 minutes earlier than us, and never saw us. They’d taken the road, and were apparently also not big fans of the heat. 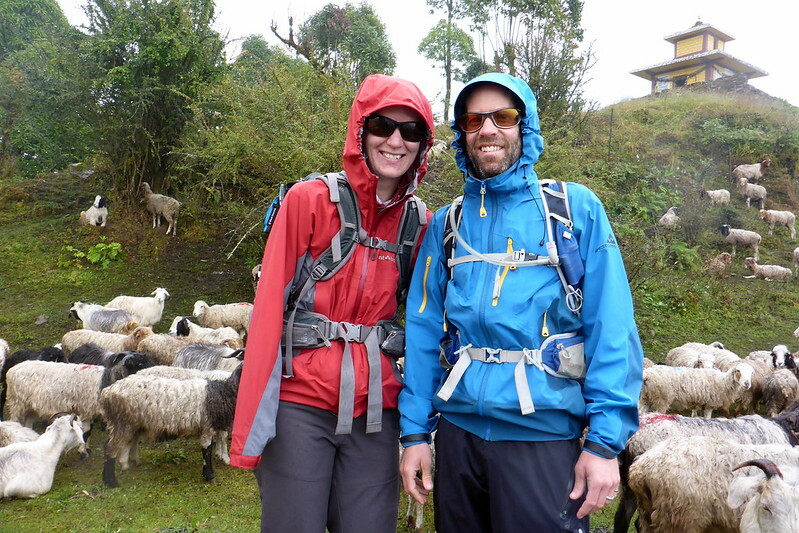 They were surprised how quickly we’d gotten to where we were, which spurred us on to keep pressing on and gaining altitude, in hopes the payoff would be a respite from the oppressive heat. However, that makes it sound like this was a hardship. In fact, the hike was beautiful, and another clear reminder of the fact that Nepal truly is a land of varied terrain and environments. We felt lucky to be experiencing all the different areas of this spectacular country! 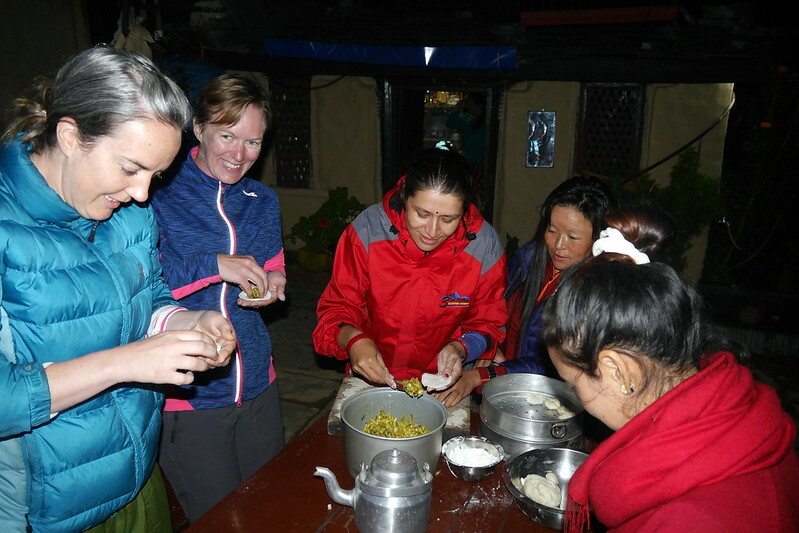 Around mid-day, we stopped in the little village of Shikha for lunch, fueling up on another great freshly prepared trekking meal. I swear as I type this I’m salivating for the food we had along the way at all our stops! For a rare treat, thanks to the heat, Deanna even treated herself to a bottle of the ubiquitous Fanta Orange pop to refresh. Lucky for us, after lunch, there was a slight breeze, and we found ourselves in a few more shady patches, so it wasn’t quite as hot! We wrapped up our trekking about an hour and a half later, popping out at Chitre, yet another little village with jaw-dropping views. This stopping point found us a at 2,391m, but it was still very sunny and warm. Given that we had lots of spare time again, we laid out our sweaty trekking clothes to dry while reading, playing cards, and enjoying tea and popcorn in the warm sun. We felt we could have trekked further, but got the sense that this was probably the best part to stop, thanks to the great views and fact that the next day’s trekking would again have us continue on a very much upward trajectory. I mentioned climbing right? Well this day would have lots of that. 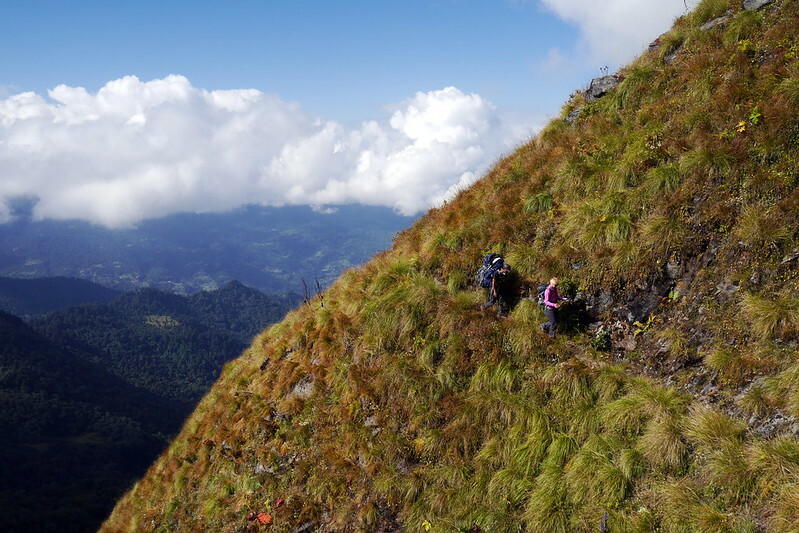 In order to avoid a lot of backtracking to get to a main trail to our next destination, we opted for a less conventional track that lead us on a steep descent before embarking on the lion’s share of our climbing for the day. In fact, over a distance of less than 10k, we’d be climbint 1,800m, and would end our day at 3,660m, where it definitely promised to be a LOT cooler. However, the reason for this climb was to get to Khopra Danada, well known for it’s wide vistas of the surrounding mountains at sunset. Sadly, it wouldn’t be that way for us. Things definitely started out beautifully in the morning though. As we got underway, the sun was still lazily making its way up in the sky, and when we were in the shade, things were cool. The trail we’d chosen was not well indicated, and our guide ended up asking a few locals along the way to confirm our route. We also meandered through a village where our guide explained to us that as a young boy, he had traveled here on foot from his village with his football team to play in a tournament. What a different world. This place was over a mountain pass, inaccessible by road, and he would walk here for weekend tournaments, billeted by local families. It was actually an interesting side story that gave us more insight to growing up here. We climbed ever higher, stopping only once at a single structure in the middle of nowhere known as <Ever Green Rest Cottage>. At this place, we crossed paths with some wool merchants that were hiking down the mountain with giant woolen backpacks loaded down with the yak wool that they were seeking to sell. 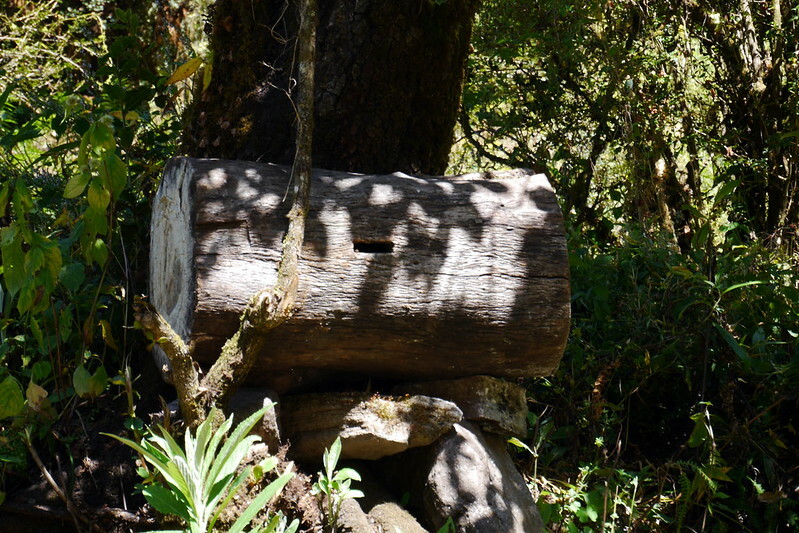 Here, we were also exposed to a neat kind of beehive that is set up within a hollowed out old log. We’d see a few more of those on our way, and that is why we were taught a bit more about how many Nepali people keep bees. Good thing they do, given the danger that bees are facing globally of being wiped out. Wanna learn more about that? Watch this TED talk on “Colony Collapse Disorder”. And yes, we should ALL care about this. But I digress (importantly). After our little rest, we kept climbing, but as the day wore on, and we got higher, we realized that we were most likely headed into a low visibility zone. It was becoming clear that not much higher above us, we’d be entering the clouds. Unfortunately, this would be the trend for the next few days. 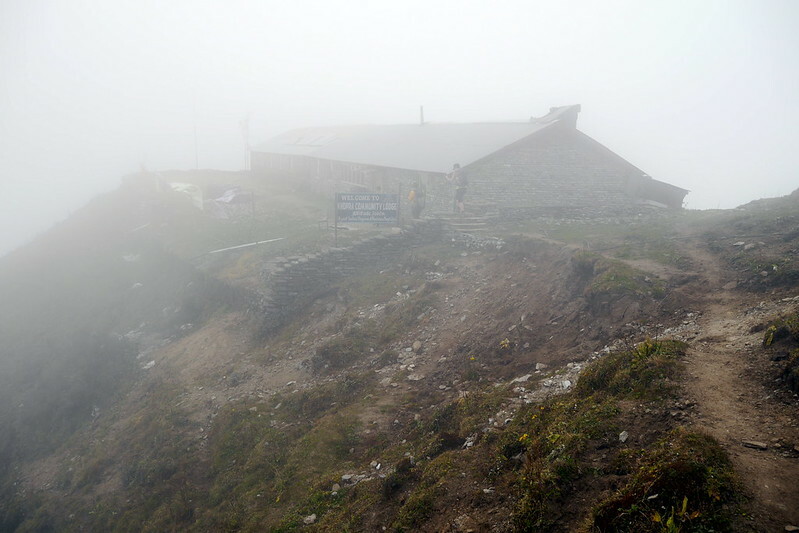 As such, the rest of this hike became a bit of a spooky walk in the clouds at altitude. For that reason, the story of the mysterious disappearance of a tourist in this very region was even more haunting. This fellow was part of a group, but had gone missing in the middle of a trek. No body had yet been found, but there were posters all over the place about his disappearance. Later, we’d learn there were rewards for finding him, and as such, entrepreneurial people were forming search parties and consulting spiritual leaders / guides to help in the quest. More on that in the summary of the next day! Once we finally got to the higher elevation, we completed our day’s trek by wandering through large herds of grazing yaks to end up at Khopra Danda, a gathering place perched right on the edge of a high promintory. We wouldn’t see what was special about it until the next morning though, since we couldn’t really see more than 50-100 feet ahead of us! After a very chilly night up at altitude at Khopra Danda, I was anxious to see whether or not my luck had improved with the view from here. I knew that often, early in the morning, the sky is clear. As such, I was up before sunrise pulling on warm layers to go check things out. I was VERY glad I did, as I was treated to some very beautiful views. Not cloudless, but I could at least get a sense of the vistas around us (technically, what we were looking at were the Dhaulagiri Himal) . Good thing I did get up though, as these views were quite short lived. Within an hour, things were clouded over, and the weather forecast didn’t sound good. We could have stayed an extra day in hopes of clearing weather, but from the last time I had checked forecasts, we opted to keep moving. It was the right call, as you’ll soon learn. Go on now, click right and left to scroll through this embedded album! After marveling at the sights while eating breakfast, we packed up and headed out. 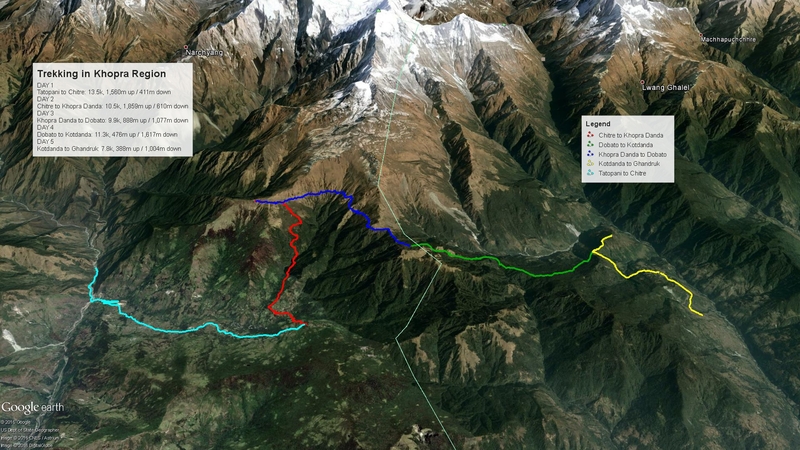 Interestingly, we had two route options. The first would have us backtracking downhill only to climb back up. The second? Well, technically, it was a ‘closed’ route that was ‘not recommended’. Why? Well, remember that guy who disappeared? Yup, it was on this trail. So which did we choose? Did you even need to ask? Of course we took the ‘road less traveled’! After all, our guide is a certified mountain rescue guide. The warnings were more for people on their own. 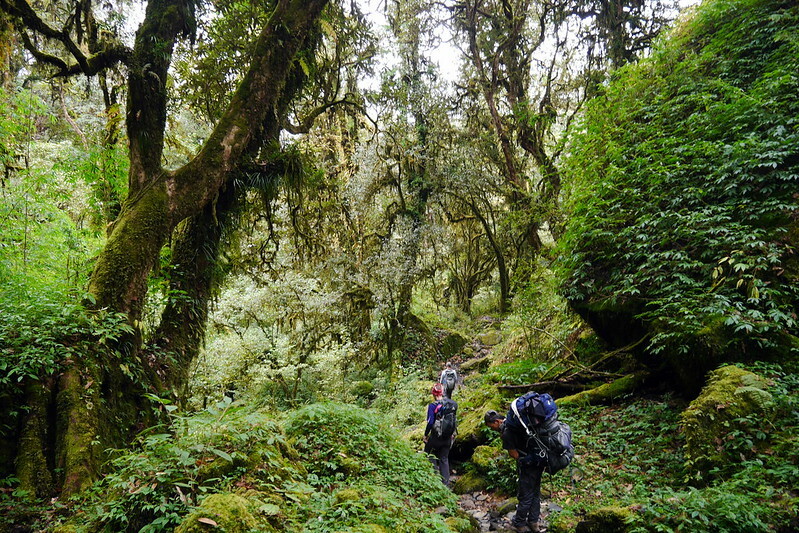 We set off on what was a very interesting trail hugging the steep contours of the hills, and semi overgrown. It would have been completely overgrown were it not for the occasional yak herders with their yaks and guard dogs. Yes, we had to step carefully around these dogs, as they are VERY protective of their yaks. No petting fido up here! As the morning wore on, we continued winding our way along the mountains, eventually stopping in a little place called Bayeli for lunch. The morning’s trek had taken quite a bit of time thanks to the tricky footing in some places. our net elevation change on the day was -200m, but there was a fair bit of up and down. This lunch stop was a good spot to warm up a bit with a hot chocolate. 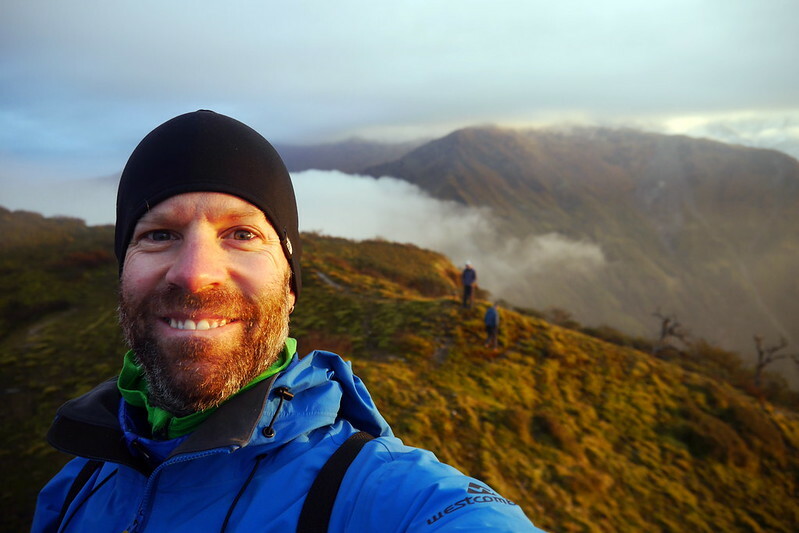 I’d opted to not wear too many layers that morning, and the cold damp wind blowing around us had put a bit of a chill on me. Also, and I’m loathe to mention it, but my foot was bothering me a fair bit that day. Grrr. At any rate, the rest, warm beverage and food set me up right for the rest of the day’s trekking, which turned out to not be too long at all, with only an hour or so of trekking after lunch. Before too long, we were coming around a bend in the trail, and could see the next stop on our trip. Dobato. This collection of a few buildings once again proved that just because a place is on a map, it doesn’t imply there is much there! The guest house where we were staying, ironically named Hotel Mt. Lucky, was actually owned by a relative of our guide, so it was a bit of a homecoming, and you could see that both our guide Ram and porter Purna were getting increasingly excited as we continued this part of our trip. The reason is that we were now on ‘their turf’. They both grew up in these parts, and have many relatives. And given the sparse populations, inevitably when we passed locals on the trail, they knew who these people were. Oh wait, I’ve gotten ahead of my self. I did say that Hotel Mt. Lucky was ironically named. Why would I say that? Oh, I don’t know, maybe because for the rest of the afternoon we sat through snow and rain storms??! Yup, after the run of great weather, we finally came face to face with some of the meteorological uncertainties in the mountains. We actually quite enjoyed getting to experience. Especially from the safety of being indoors and at the low-ish elevation of 3,426m. Higher up or more exposed, and things could be much worse. That’s why I said deciding to not stay an extra day in Khopra Danda was a good call! Thankfully, since we were staying with ‘family’, we were very well looked after, with extra tea, popcorn, and great stories and explanations about the way that people live in these parts. We also learned a lot about the different farming implements they use in these areas, and the challenges they face in the simplest of activities like getting water, whcih they actually carry in from farther away during dry periods! All in all, a great night, and once again, we were all alone in this guest house, and boy was it cold that night. 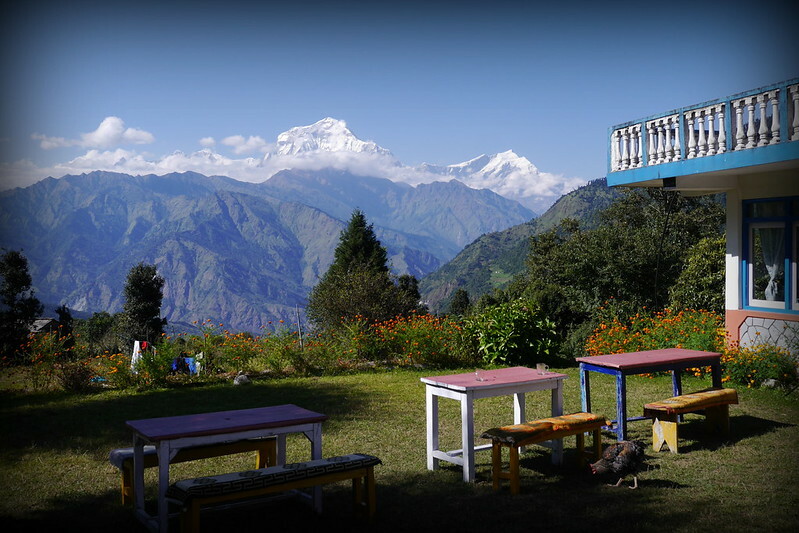 Once again, the plan was to get up early the next morning, since this place is very close to a spot called Mulde Point, from where you are supposed to be able to see 25 mountains such as the Annapurna range, Dhaulagiri range, Nilgiri, Lamjung Himal range and others. 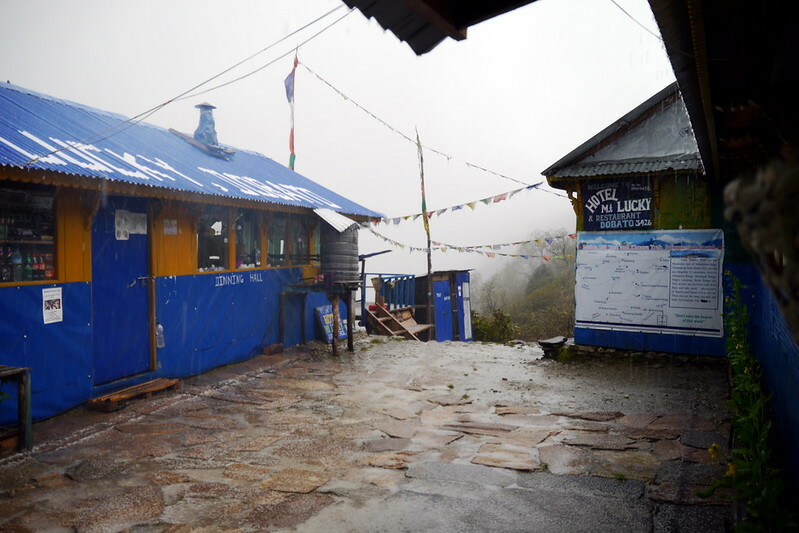 You can also supposedly see Fewa Lake from there and take good photographs of sunrise and sunset. 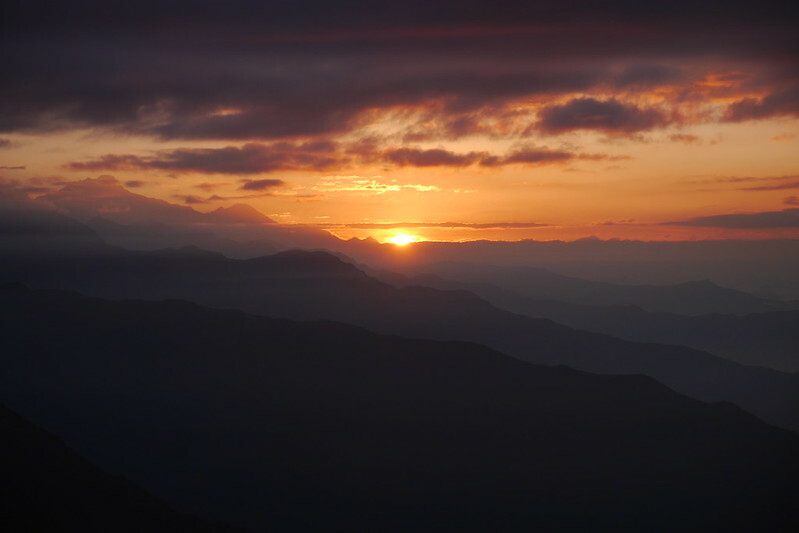 Given the weather at night, we were apprehensive, but decided to bed down, get up before sunrise, and hope for the best. Well, there you have it. Mulde View. When the sun started rising, we got a few little glimpses, but really, most of the mountains were obscured. You can click through the images in the embedded album above, but as you can tell, things weren’t quite as amazing as we’d hoped. However, in my mind, the clouds actually made it a very interesting view nonetheless, and we didn’t regret for a moment getting up early to see it. The entire place still felt very special, and we had it all to ourselves, making it that much more special. That’s right, hammocks! Whee! However, to get to that point, there would be some work ahead of us. Remember how when we started this section I described jungle-like conditions? Well, given the drop in elevation, we were heading back to jungle town! And this time, with the ever-present threat of rain :-). This part of the trek was actually really neat. The foliage was extremely thick, and we felt like we might be in some sort of west coast rainforest for a while. To make sure we didn’t finish our day too early, we stopped along the way in a village called Tadapani where, surprise surprise, the place was also owned by someone in Ram’s family! We arrived early, so rather than eating right away, we first had a nice cup of tea to warm up. 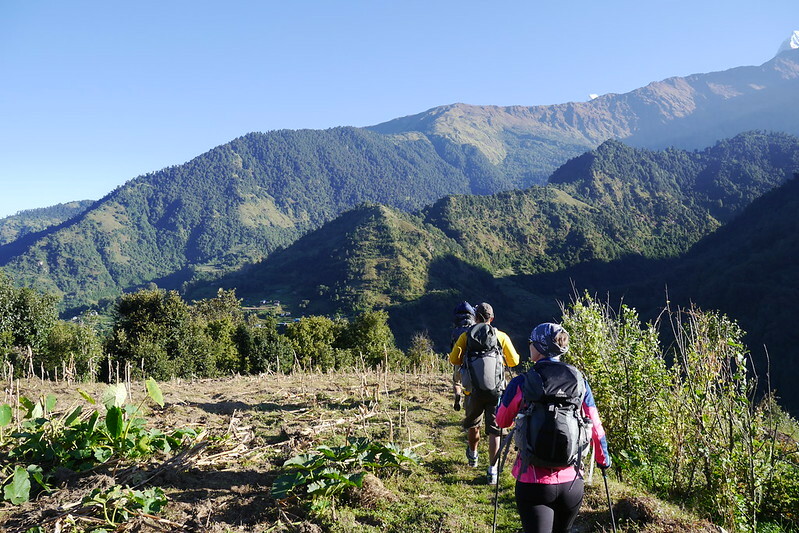 We also lingered a little longer there, as a group of trekkers coming through actually included our tour company’s owner Norbu, who was leading another group up. As such, this was a great chance to catch up with him, meet more trekkers (Canadians as well), and talk about plans in the next few days. As a result of the ongoing fuel shortage, he would be personally meeting us in Pokhara to help decide how we’d get back to Kathmandu. After that pleasant lunch, we continued on our merry way, now with the company of raindrops. This was the first time in the entire trip I had to break out my rain gear, since it was well and truly raining. It didn’t bother us too much, given that we’d already been blessed with so many great weather days. And realistically, if you’re stomping through a rainforest / jungle, isn’t that what you’d expect? Amazingly though, but the end of our journey, which culminated in a sort of ‘stairway to heaven’ rock staircase up to Little Paradise, the rain broke. Not only that, but by the time we’d settled into our room and I’d taken a quick shower with the available hot water, the skies almost cleared. At least enough so that we got the owner to string up those promised hammocks to enjoy a little swinging in the breeze while reading and rehydrating. Later on in the evening, after we’d eaten, we also watched the owner (who is actually a local pediatrician that villagers from all over come to see) making butter using traditional methods. Of course, here they are also the ‘current’ method. They have simply always made their butter this way. Our meal also included some special treats including honey that was collected from his own on-site beehives. What a great treat! Time for bed and onto our near-final trekking in the Annapurna region. 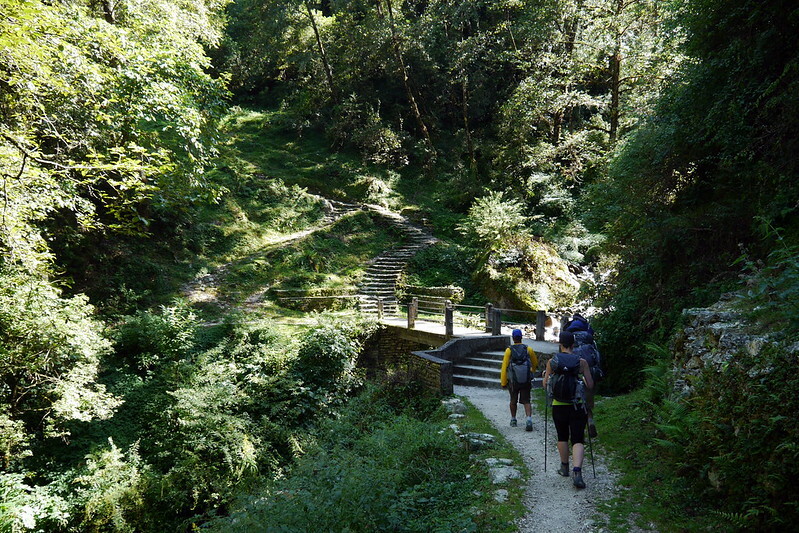 And so we arrive at our near final day of trekking, where we started at Little Paradise, trekked down down down to Ghandruk for a single night, and then the next morning out to Kimche where we would be catching a 4×4 out to Pokhara. And guess what? It was raining! Even more than the previous day. I even went so far as to put on my full rain gear, including pants, although with the heat, I’d live to regret that after a couple hours. However, our whole trek that day was going to be pretty short. Less than 8k, and mostly downhill. After another delicious breakfast, we headed down. With the heavy rains, we were once again reminded of the fact that this is leech country. Along the way, we saw TONS of little leeches stretching out their bodies from plants lining the trails hoping to hitch onto unsuspecting passers-by. While we could avoid them, we felt pretty bad for cattle / horses that share these trails, as they very often become leech meals! 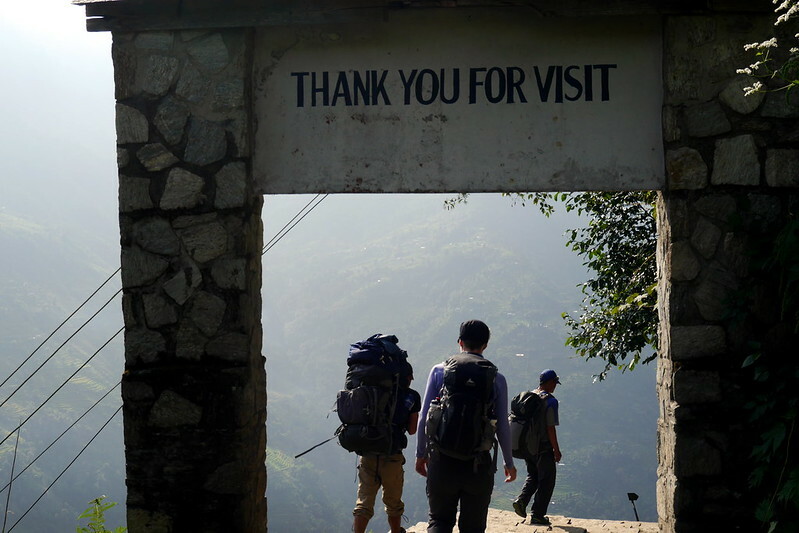 In almost no time, we found ourselves in our last Nepali guest house of the trip. We were given the choice of a traditional home-type of guest house, or to check into a more modern place. 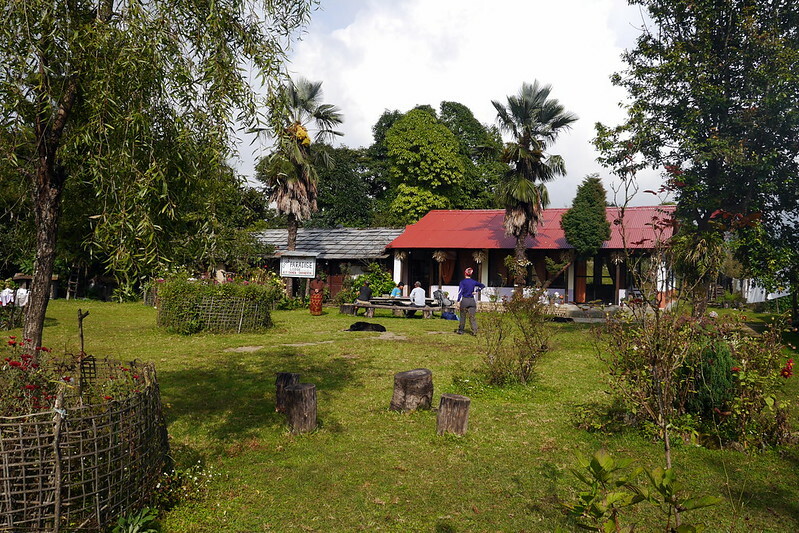 We opted traditional, and lo and behold, we ended up at a traditional Gurung guest house. Where did I know that name? Oh right, that is our guide’s last name, Ram Gurung! You guessed in, back with the family once again. Too funny. However, as with other places, this had its advantages. After settling in, we went for a good walking tour of this village, which acts as a regional center, so quite a bit larger than other villages. This included stopping in a traditional museum, as well as the local conservancy office for a presentation on their efforts to protect an enhance the region. And with that, the trekking part of the trip basically comes to a close. After lingering just a little longer around the supper table sharing stories about all our collective adventures in Nepal, it was time to turn in. 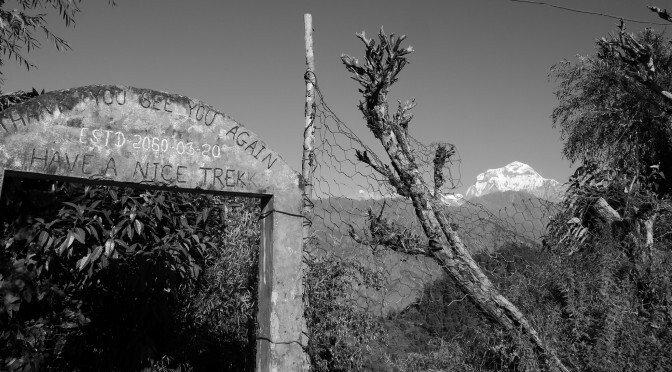 The next morning, all that remained was a 45 minute walk out to Kimche to grab a 4×4 to Pokhara, and ultimately, back to civilization and ‘western’ culture. As I type this, I’m already nostalgic for the simpler existence we both witnessed and experienced for ourselves. To those who feel this sounded like a tough trip with all the hiking, no real showers, electricity, or toilets, I will simply say that isn’t tough at all. We are spoiled, and while I am unlikely to every give the luxuries up, I had no problem adapting to a simpler way of doing things, and really just ‘living’ for a few weeks. There was no need to be ‘connected’, since I was. I was connected to my co-travelers, to the nature around me, and to the passing wanderers we met on the trails. Had there been an issue, it would have been resolved, and we were HAPPY, the entire time. 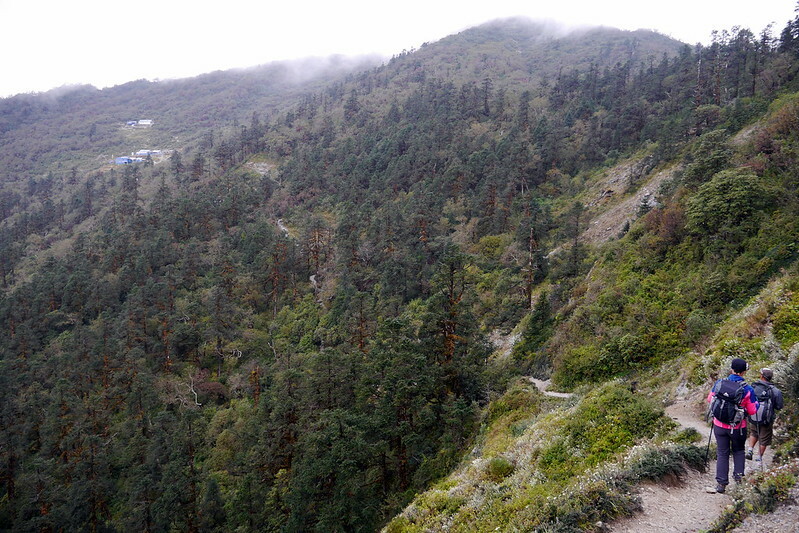 I am SO happy that we made this trip and that I finally had my Himalayan adventure. I’m not sure yet what’s next on the list, but I’m sure it will be as equally rewarding! I hope you’ve enjoyed my stories (as long-winded as they can get), and remind you all to love what you have and take the time to marvel at the world around us! Till next time, keep exploring!